Last week we published a guide on how to monitor Google Places reviews, Web updates, and content changes. It was well-received by our readers, so we’d like to build on the post and share info this time on tools for online reviews monitoring and management. Hopefully, this list will help you track online reviews of your brand, product, establishment, service, or business – and enhance your reputation as more customers talk about you on Google Places, Yelp, online directories, local business listings, and social media sites. Or, if you’ve used any of the online reputation management tools below, do let us know by leaving a comment below and sharing with us your experience. Best value review monitoring solution: Launched early this year, Review Trackers is widely considered as today’s leading online review monitoring solution. It’s designed for businesses of all kinds and sizes, including mom-and-pops, SMEs, and enterprise-level organizations and companies. A Web-based application that’s simple, fast, and easy to use, Review Trackers monitors online reviews from sites like Yelp, Google+ Local (formerly Google Places), TripAdvisor, Citysearch, Foursquare, and more. It also covers industry-specific review sites like OpenTable, Urbanspoon, and Edmunds.com, among many others. 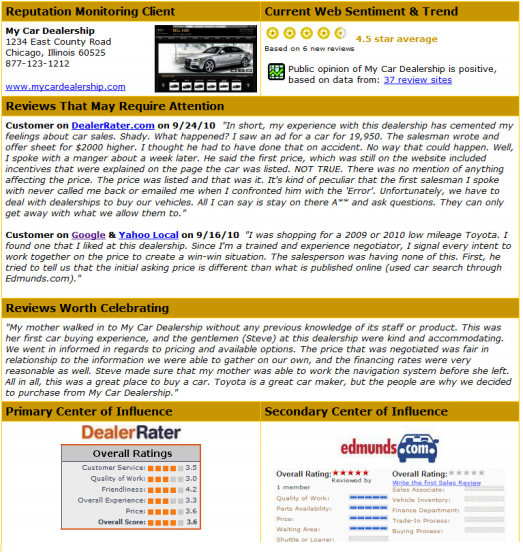 Once you get a new review from any of these sites, Review Trackers sends you an E-mail notification, so you can read the review, respond to what the reviewer is saying, and manage your online reputation. Review Trackers’ excellent feature set includes the ability to centralize all your reviews in one location; sort review data by date, source website, number of stars, or business location; integrate the app with your favorite customer service help desk, such as ZenDesk.com, Desk.com, and UserVoice; and access your Review Trackers online review management dashboard with any Web-enabled device: desktop, laptop, smartphone, tablet. Plans start at $19 a month. Texas-based ReviewPush markets itself as an “online review management tool for small to large businesses”. It offers a dashboard for monitoring / tracking reviews, protecting your brand and reputation, engaging with customers, and enhancing product offerings and promotions (such as coupons). A fairly new service, ReviewPush can be a bit pricey, with single location monitoring costing $49 a month. The company does offer discounts and bulk prices for multiple location monitoring. While DigitalSeen focuses on content management of business profiles and listings in general, it doesn’t seem to specializing in review monitoring and management in particular. But it is worth looking at for its integration with Local Matters’ other solutions and local search technologies, including Destination Search, Mobile Loyalty, and WalkAbout. 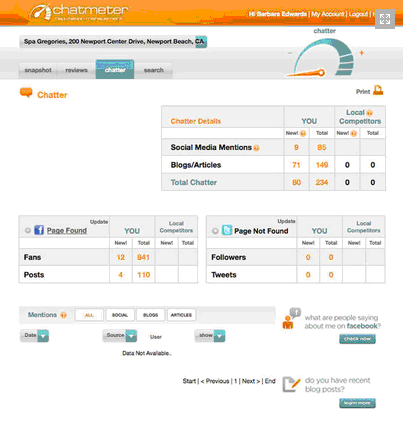 Furthermore, Chatmeter’s dashboard has the ability to search for content (links, photos, videos, reviews) on local search sites, including Google, Bing, Yahoo, Yelp, and Yellow Pages; it can also track mentions (or “chatter”) from social media sites like Facebook and Twitter as well as blogs. Premium plans start at $29.99 a month (VIPPass), with an Enterprise Plan available for clients with more than 10 locations. ReachCast by Reach Local combines proprietary technology and professional service to help local businesses build and optimize their Web presence. During setup, ReachCast creates a Cast Page, which is a content and conversation hub used to create and manage content and updates (e.g., tips, offers, promos, photos, videos, etc.) about your business across the Web. Visible currently does not offer a pricing page, but it has a video tour of the Intelligence platform and a 3-day free test drive. 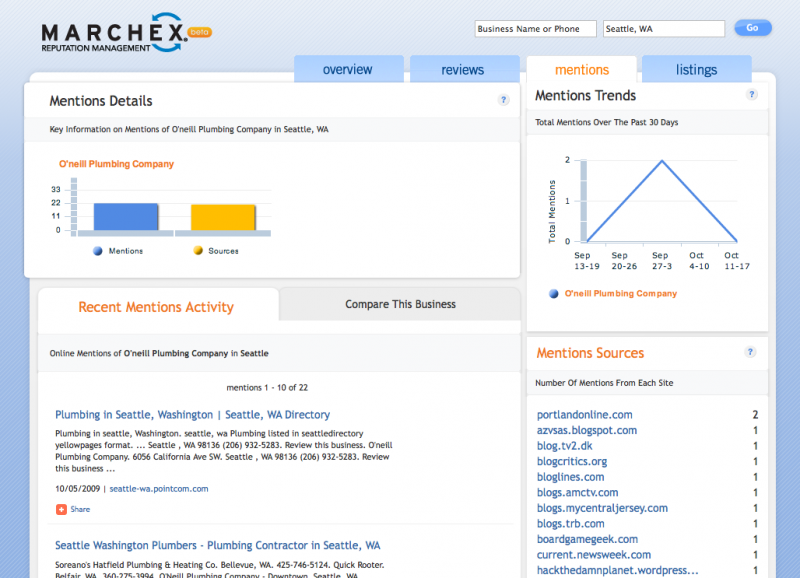 Marchex Reputation Management – often compared as Radian6 for small businesses – is an online dashboard for tracking and analyzing online listings, comments, critiques, blogs, social media mentions, and reviews about your business – from one place. It covers more than 8,000 sources (from Twitter to CitySearch) and currently contains more than a quarter billion pieces of meta-data. Reputation Ranger is a suite of online reputation management services designed to monitor public comments and reviews from sites like Angie’s List, Yelp, Google, Yahoo!, CitySearch, Trip Advisor, Insider Pages, Yellow Pages, YouTube, Twitter, and other industry-specific social media or review sites. Reputation Ranger positions itself by offering specialized services to businesses in the hotel and travel, restaurant and bar, plumbers and home contractors, and automotive sales and service industries. When live, these reports exist as a web page you access online. Reputation Ranger can also E-mail the link to current reports to as many recipients as you choose. An example of the automotive sample report can be found here. Trackur is a social media monitoring tool / software that tracks reviews, mentions, and comments from social media such as blogs, social networks, Twitter, Facebook, forums, images and video. 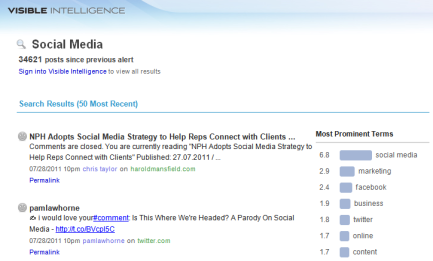 It also offers analytics and insights for understanding the influence and audience reach of those discussing your brand. Plans range from $18 to $377 a month, with an option to select prepaid annual plans. I’ve tried Review Trackers before and I must say that this is a great tracking tool. If you don’t want to miss out on a single review then you better try this tool.